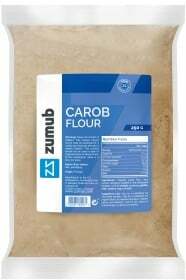 If you are looking to infuse your baked goods and beverages with the health-boosting effects and unique taste of carob, Zumub Carob Flour is the answer! Carob flour is made from dried, roasted carob tree pods, and it shares the same appearance as cocoa powder. It has a rich, sweet taste that makes it a great ingredient to be used for making pancakes, crepes, cakes, brownies, and many other desserts. Carob flour may be used to replace plain flour for making dough for pies and pizzas, and it may also be added onto your favorite smoothies, yogurt, and ice cream! Carob flour, apart from going to give an interesting and unique flavor to your baking goods will also enrich them nutritionally. Carob contains vitamins and minerals, such as vitamin B-6, calcium and magnesium, is naturally rich in dietary fiber, something that is important to promote regular elimination of body waste and to regulate appetite and has antioxidant properties. Although carob flour is used as a substitute for chocolate and cocoa powders it doesn’t taste like chocolate, but it tastes much sweeter, so you need only to use less sugar if you are to use carob flour for your baking needs, something that will make your baking goods immediately healthier and more natural. Add a healthy and tasty twist to your baked goods and beverages... use Zumub Carob Flour! Have a question about Carob Flour? What is it, what does it do, how and when to use or something else? Ask us. Use as a substitute for chocolate powder. Use as a substitute for regular flours, to prepare pancakes, crepes, cakes and desserts. Use for pie, pizza or bread dough, or add to smoothies. WARNINGS Carob Flour : Keep out of reach of children. This product should not be used as a substitute for a varied and balanced diet & healthy lifestyle. This product should not be used in case of hypersensitivity or allergy to any of its constituents. Store in a cool, dry place. BEST BEFORE: Please see lot number and expiration date stamped on the packaging.